Flat, open setting in community park. I-35E north of Dallas, take Lewisvile Main S exit, left at ramp on Main St., 0.75 mile to a right on Kirkpatrick, 1.5 miles to a right on Century Oaks, left at Arbour Way. Parking and hole #1 on right. I rated this course 3/5 because it is a well kept course that is fun to play, though not very challenging to experienced players. The concrete tees and course markings make it easy to navigate, even on your first time through. This is a great place to take beginners because it is not very technical, especially on calm days. The front nine is very short with only a few trees to get in the way, while the back nine is considerably longer, but mostly wide open. This layout is great as it lets new players with bad technique slowly warm up so they don't tear a muscle trying to set a world distance record. Also, without real water hazards, there is no chance of losing a disc (unless you somehow manage to throw into someone's backyard that has a dog). Wind is really the only issue on this course due to the lack of trees. A bad throw and you can end up in the next neighborhood over. Also, you have to watch out for unaware people on the walking/jogging path which comes into play on most holes. The course is usually busy, but not crowded, and occasionally you will get stuck behind a group of newbies that don't know the courtesy rules to let faster groups play through. To increase the difficulty of the course you can play the walkways, and drainage ditch as out-of-bounds. An experienced player should be able to shoot at or under par, especially if they take advantage of the birdie opportunities on holes 1-4. Par for the course is 55, with No. 17 marked as a Par 4. My personal best for the course is 50 (23 out, 27 in), on a fall day with little wind. Great place to learn how to play. You can drive nearly every hole so not too many bogeys. Pretty easy and usually windy. This is my home course, right up the street, and its fairly busy any day of the week, but not overcrowded. If you want to test long distance driving and Hyzers, this is your course. You can test the strength of your arm on most shots. I would consider it a step above "beginner", barely. You'll see me on hole 18 with my kids near the playground several evenings a week practicing my putts. This course is set in a nice park in the middle of a residential area which includes the amenities of restrooms, a playground, and a basketball court. The front 9 of the course has a few holes with a small drainage creek running along the fairways, but you won't have to worry about losing discs because the water usually only gets a couple inches high. 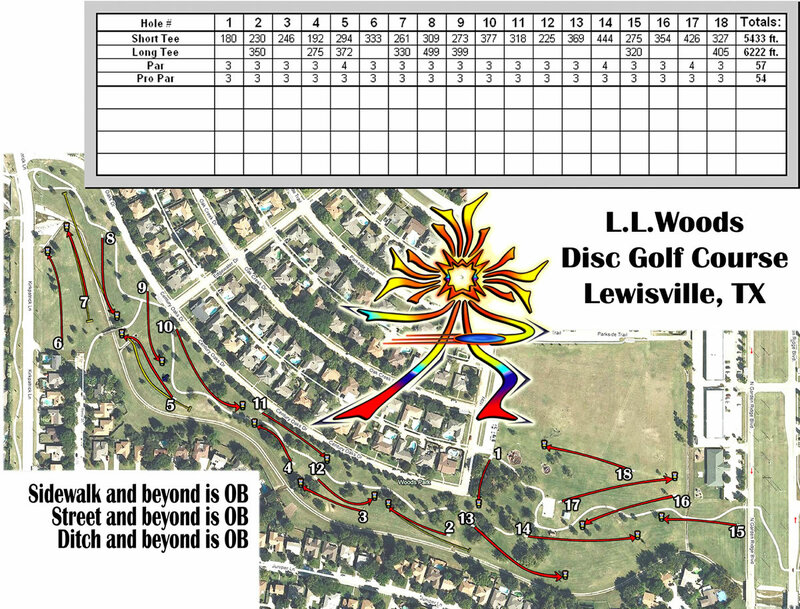 The front 9 is extremely short making for some good ace and birdie runs, but you better get 'em early because the back nine stretches out a bit and the swirling winds on this mostly open course make the back 9 a bit more difficult. Almost every holes is accessible with a hyzer(right handed) which makes it a bit more challenging for left handed players. OVERALL-great course to take the entire family and for recreational players, and can even provide the competitive player a good challenge if playing sidewalk and beyond as O.B. and if you can find the long tee pads on some holes which are not very well marked. P.S. Watch for pedestrians since a heavily used sidewalk runs most of this course.